Each design features a family of animals in their natural environment. Nothing in nature is neatly enclosed in boxes and to reflect this I have allowed part of each design to "break out" beyond the edge of the design. 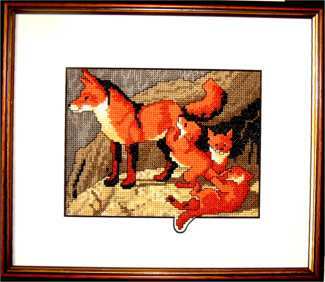 No fractional stitches are used in the badgers, heron or foxes designs. 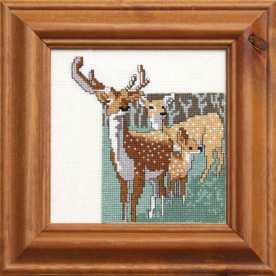 However, there is a fractional stitch in the stag's eye, to give it shape. 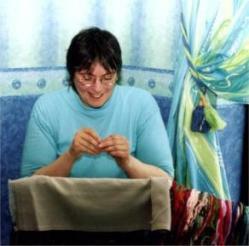 Check my instructions for fractional stitches if you haven't tried them before, they are not as frightening as you may think! This mother badger is introducing her cubs to the world outside their set. On the occasions I have seen badgers, it has been just before the daylight disappears and night draws in, when they are setting off to hunt. 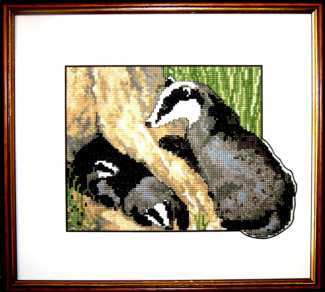 We have a number of badger sets locally - the closest is just a short walk from our home. Fallow deer fawns are born with a spotted coat. Their spots, however, do not fade as in other deer species, but stay with them into adulthood. Getting a glimpse of them is rare, unless they belong to the owners of a large estate. The Red fox commonly makes her home close to human habitation here in the UK. They are often seen rummaging amongst our waste for food scraps. We have one that regularly visits our garden and leaves "evidence" behind, that our dogs insist on rolling in! Standing perfectly still, patiently waiting for an unsuspecting fish to swim past, the heron could be mistaken for a garden ornament. 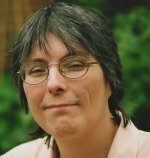 In fact, I spotted one recently which didn't look very realistic and I was just about to share my thoughts with my companion, when it flew off! 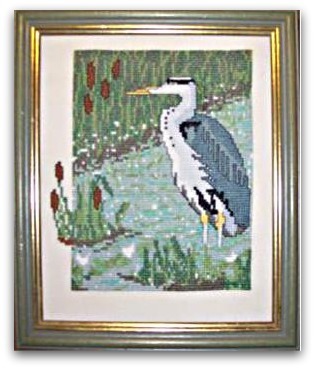 This wildlife cross stitch design was based on a photo I took of a real heron.